The use of precast, prestressed concrete piles in the foundation of bridge piers has long been recognized as a valuable option for bridge owners and designers. However, the use of these precast, prestressed concrete piles in integral abutment bridges has not been widespread because of concerns over pile flexibility and the potential for concrete cracking and deterioration of the prestressing strands due to long-term exposure to moisture. This report presents the details of the first integral abutment bridge in the state of Iowa that utilized precast, prestressed concrete piles in the abutment. The bridge, which was constructed in Tama County in 2000, consists of a 110 ft. long, 30 ft. wide, single-span PC girder superstructure with a left-side-ahead 20撘 skew angle. The bridge was instrumented with a variety of strain gages, displacement sensors, and thermocouples to monitor and help in the assessment of structural behavior. The results of this monitoring are presented, and recommendations are made for future application of precast, prestressed concrete piles in integral abutment bridges. 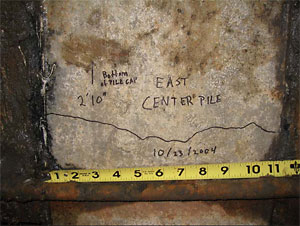 In addition to the structural monitoring data, this report presents the results of a survey questionnaire that had been mailed to each of the 50 state DOT chief bridge engineers to ascertain their current practices for precast, prestressed concrete piles and especially the application of these piles in integral abutment bridges.